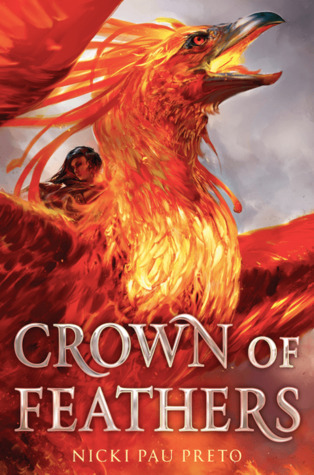 I completely missed the release of Crown of Feathers until it literally dropped into my twitter feed when it was there. I was very glad I got the read it immediately and really liked it. I give Crown of Feathers by Nicki Pau Preto four out of five hearts because it is a great new novel. Nicki has found a great new subject to write on and I wouldn’t mind if there were more books about Phoenix’. The world building is great. The idea of Phoenix Riders are not something new, but Nicki does keep it interesting and feeling new. The characters all have their own strengths and flaws, which make them great. I didn’t like Veronyka’s sister all that much because she was a complete bully and was super cruel, without really a good reason. But the rest of the characters were great. Veronyka is alone with her sister in the world, they are trying to stay safe and find their bondmates in a pair of Phoenix eggs. But she has to grow to learn to take care of herself and see what she wants. She grows so much in this book, I really enjoyed reading from her view. Tristan is a Phoenix Rider and shows us where Veronyka would like to get to. He felt like the most interesting POV but still wasn’t too bad to read from. Sev was an interesting character, he is the one with the most tearjerking POV. He is a soldier in an army he is against. If they find out what he is, he knows he will be ruined. I wished there were a few more points where his enemy was close to finding out what he is, but it was fine this way too. Overall I really enjoyed Crown of Feathers and I will be looking forward to the next book in this duology. This entry was posted in Book Review and tagged Adventure, Book Review, Drama, Fantasy, Nicki Pau Preto, Romance. Bookmark the permalink.